The value of a Mother and Child - 6 cents 1968 stamp depends on several factors such as quality and wear, supply and demand, rarity, finish and more. Values in the section are based on the market, trends, auctions and recognized books, publications and catalogs. This section also includes information on errors and varieties and characteristics. 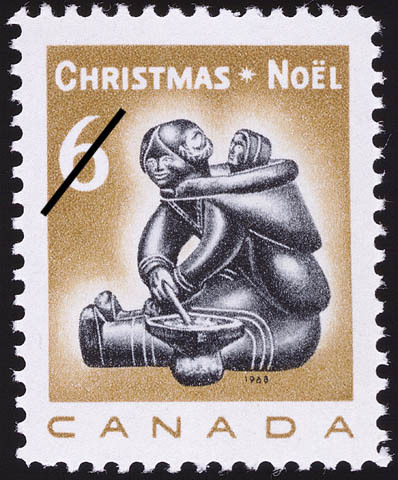 Examples of a unique art form peculiar to a Christian people whose native haunts are in the remote frozen north have been chosen as basic design elements for 1968 Canadian Christmas Stamps. Authoritative writers emphasize that there are few art forms in the world about which more erroneous information has been disseminated. Among other things, they question observations that Eskimo carvings may be regarded as perhaps the last unspoiled indigenous and spontaneous art. Certainly the origin of Eskimo carving is as unknown as the origin of the Eskimo race itself. Investigators assure us that Eskimo art has undergone many changes during thousands of years of recorded history of the race. The size of carved objects is one indication of change; it is known that in earlier eras the items were invariably quite small, miniature every day requirements were frequently placed in the last resting place of a tribe member in the belief he would have no difficulty in enlarging them for future use. The migratory habits of the people in the earlier eras undoubtedly inhibited the production of large pieces; unnecessary burdens were avoided at all cost. Materials used have varied through the ages. An early preference for ivory has been supplanted by a wide use of soapstone, the impure massive form of talc. Archeologists tell us that finds of pre-historic Eskimo carving in soapstone are extremely rare; it is said that only one specimen of such work has been unearthed in the Canadian Arctic, a miniature dug up at Igloolik which dates between 500 and 1300 A.D.
A polish for the soapstone pieces is achieved by the use of stone dust and the end product is frequently carefully wrapped and immersed in seal oil to impart a desirable lustre. In some instances the Eskimo attempts to create likenesses of animals he has never seen; this urge has been associated with the known primitive concept that to make a likeness of an object will serve to materialize it. The carving chosen for reproduction on the higher value Christmas issue is Mother and Child, a work by Munamee, Cape Dorset, Baffin Island; this carving was presented to Her Majesty, Queen Elizabeth at Halifax, Nova Scotia on behalf of the people of Canada during the Royal Visit in 1951. The 2nd denomination has as its central element Family Group, a carving whose author is unknown but which was acquired in 1960 by the Winnipeg Art Gallery for their permanent collection.